Sean Dyche says that emotion will be parked to one side when he returns to Vicarage Road for the first time as a Premier League boss. The 45-year-old, who served the Hornets as a player, youth coach, assistant boss, and first team manager, has many fond memories of his time at the club and strong bonds with the people associated with it. The former defender was particularly close to the late Graham Taylor OBE, who handed Dyche his first job in management during his tenure as chairman with the Hertfordshire outfit. The Turf Moor chief attended St Mary's Church in Watford on Wednesday as the footballing world paid an emotional farewell to the one-time England coach while remembering the achievements of a man who earned unprecedented success over 15 years in two separate spells at Watford. "It was a great day, the way it was delivered and the way it was taken care of was fantastic," he said. "They're not easy affairs, not when it was someone who was so big from what he has done in the game, in the media world, and particularly in that location. I thought it was handled fantastically well by all. "I played there, I was youth coach, assistant manager and first team manager. I’ve got a fair connection there. "I respect all the clubs that I’ve been at but they get parked quickly, because you have to move on. "There’s an attachment to the fact I had some very good years at the club and for a year with Graham, but it’s parked before we play them on Saturday." The Clarets take on Walter Mazzarri's men in search of their first win of the term away from home. Burnley have gone close on their travels in recent outings, narrowly losing out to the division's head ponchos including Spurs, Manchester City and Arsenal. 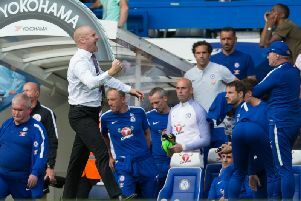 Dyche feels that performance levels on the road have started to match up to those on home territory but declared that those displays need to be upgraded to points. "You’ve got to look at performance levels overall," he said. "We’d all take a lucky win but there’s no real future in a lucky win every week. "Get the performances right and you get your rewards from that. There’s been a difference in performances. "Chelsea were really good, Southampton we were at least off. West Ham you’re scratching your head thinking how didn’t we get something from that? "Arsenal is the same, that was out of our control, as was Tottenham. They’re deemed excuses at the time but they had an effect on the outcome. "A manager can get in excuse mode as well and you look so far at things that aren’t going for you that you forget what is going on. If you take those excuses away the performances were still good, but you’ve got to turn them into wins."